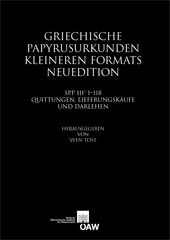 (Studien zur Paläographie und Papyruskunde III & VIII)" by the Viennese scholar Carl Wessely. The documents are not only central to our knowledge about the various aspects of law, administration, society and economy in ancient Egypt from the 5th to the 8th century AD, but they also provide essential insights into the social and economic conditions of the Mediterranean world during the ancient as well as the early medieval and Arabic period. The edition is a fundamental revision of all the material and includes numerous new readings and corrections based on the original documents and the piecing together of fragments whenever possible. Every text is presented with a full translation, extended annotations and editorial notes, indices and plates, and each volume contains a detailed introduction to the groups of documents, their contents and formal features. The complete edition is scheduled to comprise ten volumes.